Throughout his life, Telford worked relentlessly on multiple projects, scattered across the country. His tireless work created a huge body of engineering achievements, from fen drainage to canal building, church design to harbour development. Telford kept pushing forward, even in his final years. Through his lifelong connection with the British Fisheries Society, a connection that began in the 1790s, Telford advised on improvements to many harbours and settlements in northern Scotland. One of his major projects, which drew on his engineering, architectural and planning skills, was the settlement of Pultneytown in Wick. The settlement included facilities for curing fish and a new harbour for the fishing fleet. His designs were implemented over several decades and the results still stand. Telford's honorary work for the Society had led to his survey work of the Highlands in 1801-02 for the government. The survey in turn brought about the establishment in 1803 of the Commission for Roads and Bridges, and one of his greatest engineering feats, the previously-mentioned Caledonian Canal. After the Battle of Waterloo (1815), the country's economy was in trouble  the long years of the Napoleonic wars had taken their toll. The Exchequer Bill Loan Commission was set up to help finance public work projects that would generate employment. As adviser to the commission, Telford was to give his opinion on all works involving civil engineering. It was an important, time-consuming job. In 1829 alone he reviewed at least 20 projects. Indeed, Telford's skills in public engineering extended to the design of harbours, docks and piers. He worked on improvements to more that 100 of these during his career, including Aberdeen Harbour, Glasgow Harbour and Dundee Harbour. In 1826, he was called upon to engineer a new harbour right in the heart of London by Tower Bridge. 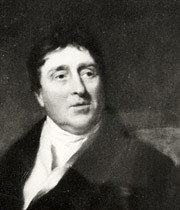 Telford was responsible for the dock, Philip Hardwick the system of warehouses. The site is awkward and Telford's solution was to form two irregularly-shaped, interconnecting docks. This meant each could be cleaned out without disturbing the other. The new docks took their name from a hospital that originally stood on the spot, St Katharine Docks. Telford also advised on numerous water supply schemes. He advised on a new piped supply for Liverpool (1799 - 1802) that was pumped using steam engines from springs located at Bootle. From 1810 to 1822, he was consulted on the Edinburgh water supply. Working with local engineer James Jardine, Telford was involved in the construction of Glencorse Reservoir and its earth dam, one of the tallest in Britain at the time. Even in his later years, Telford was keen to take up new challenges  like work on Fen drainage. In 1818, he advised on the John Rennie-designed Eau Brink Cut above King's Lynn in Norfolk. Then in 1827, he worked with the younger John Rennie on the Nene Outfall Cut. Here, during a visit to Crab Hole, he was drenched in a sudden storm and taken seriously ill. He had to stay in Cambridge for two weeks, where he nearly died. He never fully recovered. The Nene Outfall Cut made possible Telford's most important achievement in the Fens. Between 1830 and 1834, he engineering the draining of some 19,500 hectares of the North Level.